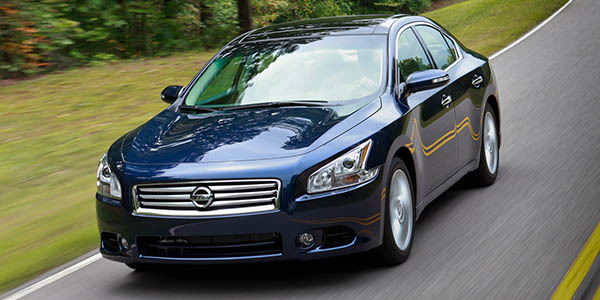 The Nissan Maxima dates back to the 1980s when Nissan was called Datsun. The Maxima replaced the 810, but it got its start as the 810 Maxima that offered more standard features than the Deluxe model. The Maxima has been redesigned several times over the years and received the marketing term 4DSC, 4-door Sports Car, because of its 3.5L V6 engine and sporty suspension. The seventh-generation Maxima (A35) was redesigned in 2009 and shares the Nissan D platform with the fourth-generation Nissan Altima and second-generation Nissan Murano. 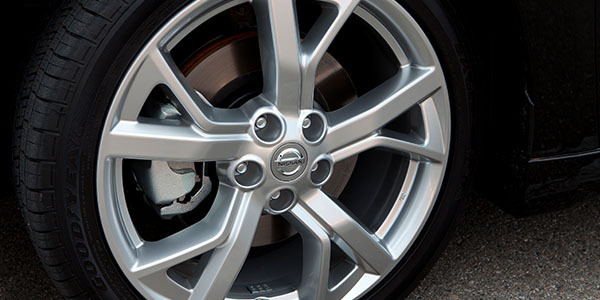 These brake systems are known to make noise if the proper procedures are not followed and brake materials are not installed properly. The OE pads use a Non-Asbestos Organic (NAO) compound. The NAO material provides increased resistance to brake squeal. Some customers have complained about noisy brakes on these vehicles, so it is a good idea to explain the different pad compounds and varying degrees of noise resistance to let them decide which best suits their needs. Customers may also complain of a clunk noise or pedal pulsation that occurs after the engine is started. Nissan says this is a normal ABS Self Check noise as the system does a self check. On some models, this self-check occurs with the first application of the brakes after the engine starts. On other models, the self-check happens the first time the vehicle reaches 5 mph after the engine starts. If a customer complains about a brake pedal that is either too low or too high, be sure to check the calipers for correct installation and that the hardware and slide pins are working properly. It is possible for a Low Brake Fluid light to come on just because of pad wear. Brake pad thickness for the front should be more than 9 mm, and more than 7.5 mm in the rear. The brake rotors should be turned or replaced if the fronts are less than 26-27 mm thick and the rears are 14-15 mm thick. Make sure you check the runout with the rotor torqued to 40 ft.-lbs. on the hub. Also, check the hub for any rust around the lugs and for anything that might cause an uneven mounting surface. Runout should be less than 0.035 mm (0.0014 in.) on the front and 0.05 mm (0.002 in.) on the rear, measured with the rotor on the hub. If not on the hub, the rotor should be measured for thickness in eight places with less than 0.015 mm (0.0006 in.) on the front and rear sets. 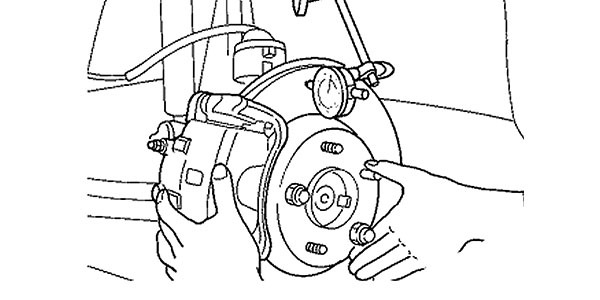 To adjust the parking brake, remove the lower instrument panel on the left-hand side and partially depress the parking brake pedal to get access to the adjusting nut. Rotate the adjusting nut and loosen the cable. Then, disengage the parking brake pedal. Measure the inner diameter of the rear rotor and transfer the measurement minus 0.6 mm (0.24 in) to the parking brake shoes and adjust accordingly. To adjust the cable, operate the pedal at least 10 times so that it is fully engaged between 4-5 clicks with medium foot pressure. Then, disengage the parking brake pedal and make sure there is no drag on the brake. The seventh generation ran from 2009-‘14 and sold reasonably well, but not as well as the earlier versions. However, there were almost 400,000 of these vehicles sold, so there’s plenty of opportunity to work on one of these seventh-generation Maximas.